It's summertime! Whether you spend the warmest season of the year barefoot with the ocean breeze whipping in your hair, or outdoor sipping lemonade to beat the blazing heat, celebrate summer with new fun-in-the-sun designs. 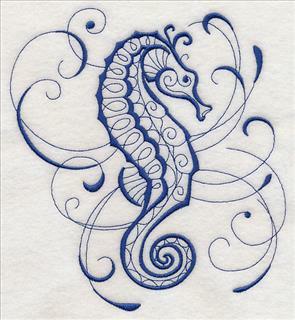 Add an Intricate Ink seahorse to your beach tote bag, or a "Summer Lovin'" design to your next favorite t-shirt. Adorable animals decked in summer gear are fabulous additions to swim cover-ups and beach towels; new hibiscus designs amp up your warm weather apparel. 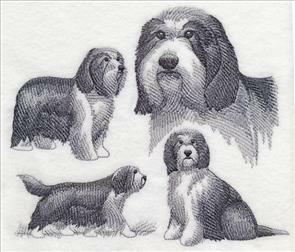 There's even brand new toile designs to add to pillows, quilt blocks, tea towels, and more! 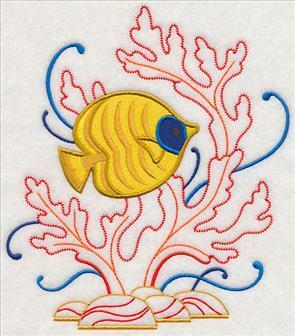 Scroll down the page and get inspired to start your summertime embroidery projects! 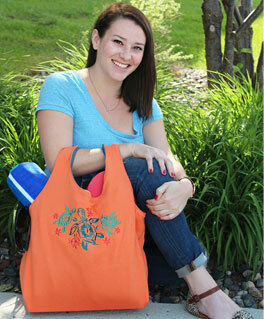 Transform an old t-shirt into a unique and creative tote bag. Click here for free instructions! 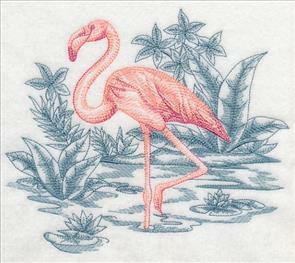 A majestic flamingo lends a summery touch to a sophisticated scene. 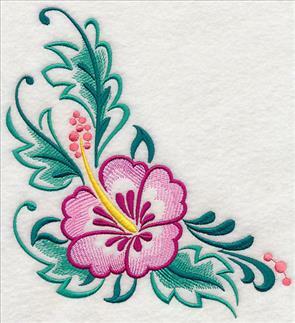 This elegant embroidery design is particularly beautiful when stitched on smooth, neutral fabrics such as quilter's cotton, linens, and tea towels. 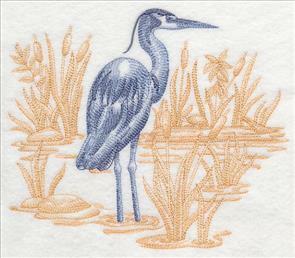 7.78" x 6.73" and 6.77" x 5.85" and 5.61" x 4.85"
An exquisite great blue heron pops against a subtle wetland stitched in toile style. 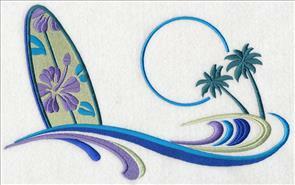 Stitch the light and airy summertime scene on a variety of embroidery projects, such as pillows, quilts, towels, or more. 7.79" x 6.61" and 6.87" x 5.83" and 5.74" x 4.87"
Toile designs feature light stitches and open areas that allow the fabric to show through, meaning they're a quick-stitch option for summertime crafting. 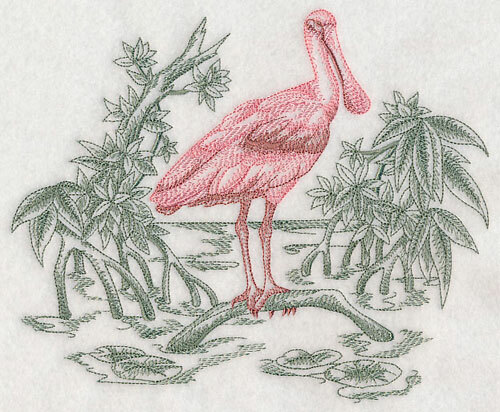 The lovely spoonbill design below is a fabulous example of the classic toile stitching style. 8.33" x 6.88" and 7.78" x 6.42" and 7.09" x 5.85" and 5.87" x 4.85"
Bright, vibrant colors and a mix of stitch-filled and open lines combine to create this set of gorgeous summertime designs. The layers of texture and color give the sea life designs a unique look that is perfect for stitching on tote bags, pillows, quilts, and more. 8.57" x 6.85" and 7.82" x 6.25"
7.34" x 5.87" and 6.06" x 4.85"
7.83" x 7.58" and 7.07" x 6.85"
6.07" x 5.88" and 5.03" x 4.88"
Bright color choices and eye-catching detail give the lobster and tropical fish designs below a fun and fabulous look. 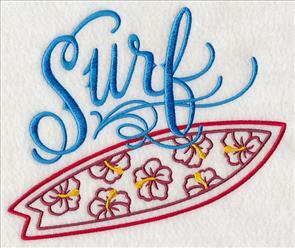 Stitch the summer-friendly designs onto towels, wall hangings, and outdoor decor to add a touch of ocean flair to your home. 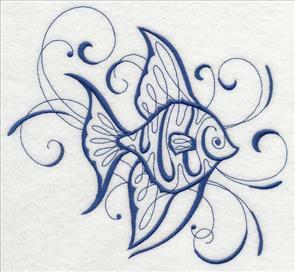 6.85" x 7.73" and 5.87" x 6.62"
6.85" x 7.75" and 5.87" x 6.65"
4.84" x 5.49" and 3.44" x 3.87"
Intricate Ink designs are always a fan-favorite, and these sea life variations are graceful, contemporary additions to the series. 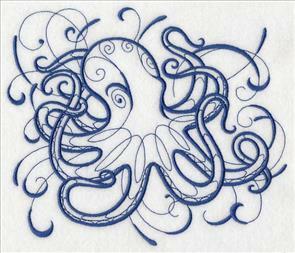 Long, elegant strokes and tattoo-inspired lines give these seven sea creatures, including the shark and octopus below, an unexpected level of depth and texture. 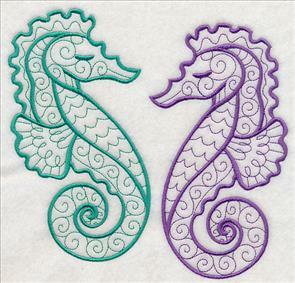 Because the inky sea creatures are stitched using just one color thread, the aquatic designs are surprisingly quick to stitch. 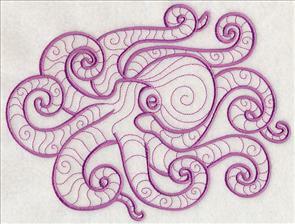 Alternating between thinner and thicker lines give the jellyfish and seahorse designs below a whimsical feel. The playful swirls and complex detailing in these sea life designs mimic the natural flow of the ocean waters the creatures live in. We stitched the designs in a dark blue thread to match the underwater theme, but you can pick whatever color works best with your project! 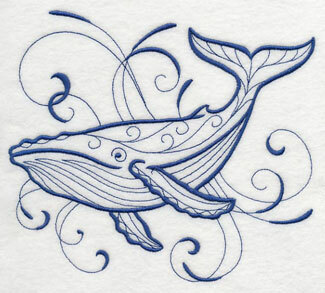 5.36" x 4.85" and 4.26" x 3.86"
Finish your Intricate Ink Sea Life collection with a stunning depiction of a majestic whale. 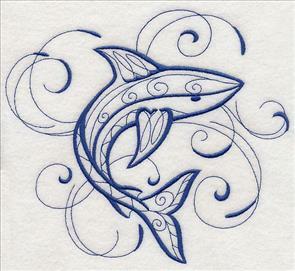 Stitch it alone, or pair it with the other sea creature designs for a full collection -- we love them as a group of framed pieces or on a quilt. 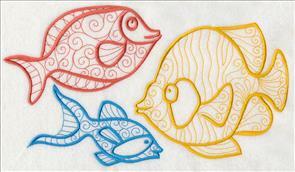 7.82" x 6.90" and 6.64" x 5.86" and 5.51" x 4.87" and 3.88" x 3.42"
These striking, inky sea life creatures are the perfect additions to your embroidery design collection. Pick your favorites by using the links above, or get all seven inky designs in a design pack. 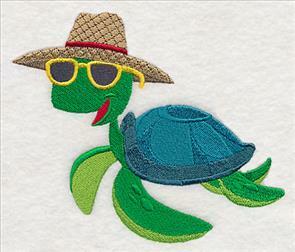 A charming crab and smiling sea turtle show off their shades in these adorable embroidery designs. 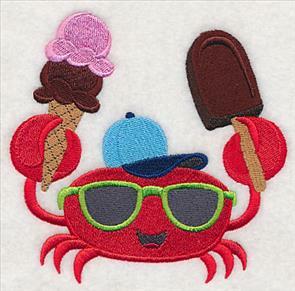 Each of the two beach-friendly critters has a special summery accent to set them apart: the crab grasps a pair of sweet icy treats while the sea turtle beats the heat with a straw sun hat. 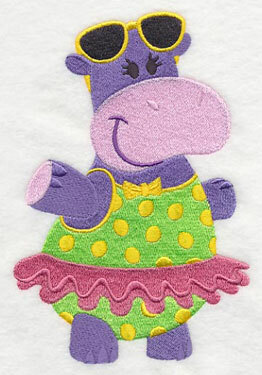 5.80" x 4.83" and 3.86" x 3.22"
Keep the cuteness going with a swim-ready hippo and penguin hula dancer. 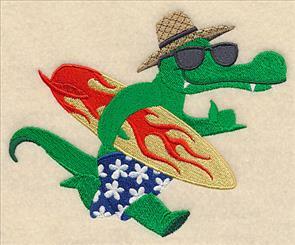 The fun and friendly animals in sunglasses are terrific additions to beach towels, cover-ups, tote bags, and more! 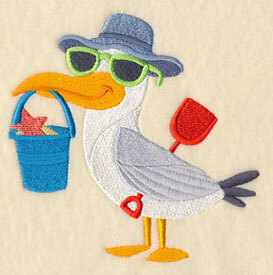 4.58" x 5.29" and 3.34" x 3.86"
Hang ten with a beach bum alligator, or build a sand castle with a summertime sea gull. 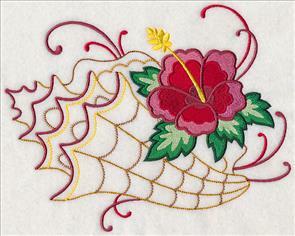 Stitch one as an accent design on your next project, or pair the designs together for an all-over summertime theme. 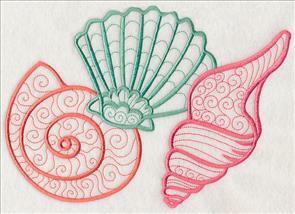 4.85" x 4.93" and 3.80" x 3.86"
These cute critters will have you clamoring for summer in no time! Choose your favorites by using the links above, or get all six in a design pack for an even deeper discount! 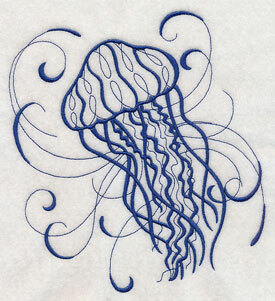 Delicate line work transforms simple sea life designs into majestic pieces of art. 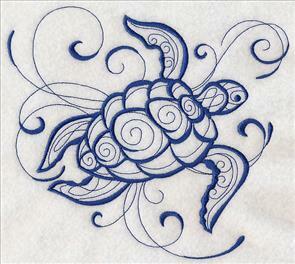 The sea turtles and seashells depicted below use lace-like details to give the designs an unexpected and impressive look that's ideal for adorning pillows, bath decor, and beach gear. 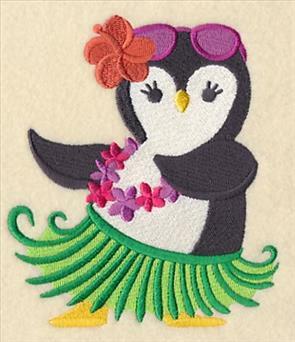 7.81" x 6.64" and 6.90" x 5.86"
9.81" x 6.91" and 8.32" x 5.86"
7.81" x 5.51" and 6.90" x 4.86"
Give your embroidery projects a tropical feel with a pair of intricate seahorses or a lively hibiscus bloom. Summer fans won't be able to get enough of the set of delicate sea life designs, especially when displayed as a collection. 7.47" x 6.91" and 6.34" x 5.86"
Round out the rest of your sea life collection with brilliant likenesses of an octopus and tropical fish mid-swim. The bright colors add a hint of fun to the lovely detailed designs. 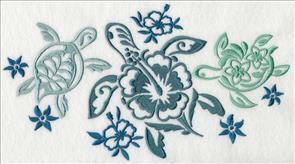 8.98" x 6.91" and 7.62" x 5.86"
Celebrate summer with a serene surfboard scene and floral sea turtle trio. 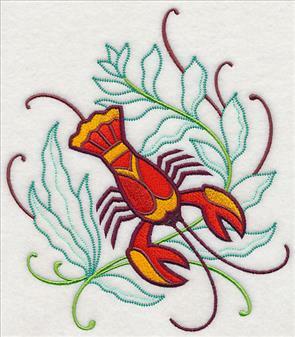 These warm weather designs are great on tote bags and towels, but we especially love the idea of stitching them on shirts. 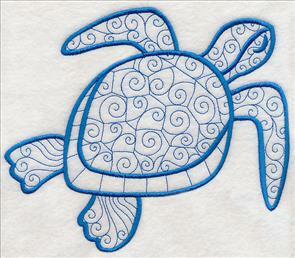 Get instructions for embroidering on t-shirts here! 11.13" x 6.90" and 9.40" x 5.83"
7.80" x 4.84" and 6.84" x 4.25"
We're obsessed with everything summer has to offer! 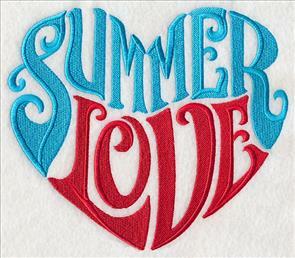 Show your love for the sunniest season of the year with these warm-weather designs. They're top-notch additions to t-shirts, tote bags, towels, and outdoor decor. 11.65" x 6.90" and 9.40" x 5.57"
7.80" x 4.62" and 6.86" x 4.07"
7.80" x 6.69" and 6.83" x 5.85"
5.64" x 4.84" and 3.86" x 3.31"
Tattoo-style script gives these board designs their unique look. 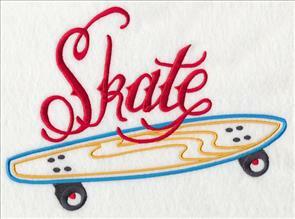 Whether you're a fan of surfing or skating, you'll love how the fun designs look on t-shirts, sweatshirts, and more! 9.43" x 6.91" and 7.81" x 5.73"
7.81" x 6.47" and 7.07" x 5.86"
5.84" x 4.84" and 3.86" x 3.20"
Add a touch of tropical fashion to a t-shirt or dress with this stunning neckline design! 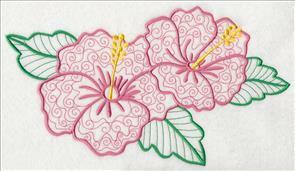 Bright hibiscus blooms are a colorful way to add style to your favorite outfit. 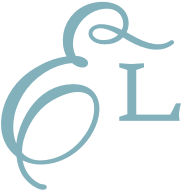 Learn how to stitch the necklines onto shirts and dresses here. 9.39" x 3.93" and 6.86" x 2.87" and 5.25" x 2.20"
6.65" x 3.88" and 4.86" x 2.83" and 3.72" x 2.16"
Pair your new hibiscus neckline with a fashion-forward corner design! 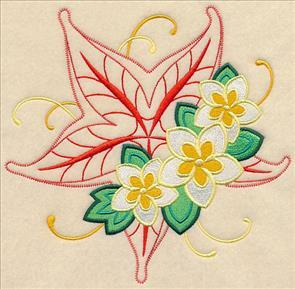 We love stitching the vibrant flower on pockets, jacket backs, and shirt shoulders. 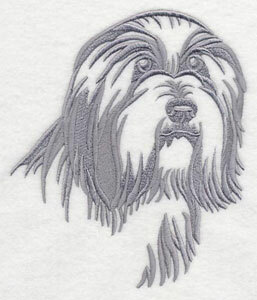 6.90" x 7.49" and 5.86" x 6.36" and 4.86" x 5.27" and 3.55" x 3.86"
Dog breed designs are always popular choices for embroidery projects, and these Bearded Collie designs are fabulous additions to our pets department. We've had several requests for this adorable pup, so we created two designs for you to stitch: a sketch of the collie in varying stages of play, and a classic silhouette. 5.86" x 6.94" and 4.84" x 5.73" and 3.26" x 3.86"